Arsenal will aim to begin the new year on a positive note after 5-1 hammering against Liverpool on the weekend. Arsenal will aim to begin the new year on a positive note after 5-1 hammering against Liverpool on the weekend. The North London club is set to host derby rivals Fulham at the Emirates Stadium in the Premier League on Tuesday. The Unai Emery-led side are currently in the fifth position with 38 points and Manchester United are lingering on the sixth position, just three points behind. A win for the Gunners is thus crucial in a bid to keep their top four hopes alive this season. Arsenal striker Pierre-Emerick Aubameyang is the top scorer of the Premier League and with 13 goals and will look to help his team with more goals. Visitors Fulham is looking to get out of the relegation zone – they are currently on the 19th spot and a win can take them out of the bottom three. When and what time will Arsenal vs Fulham start in the Premier League 2018-19 match? The match will kick-off at 8:30 PM IST on Tuesday, 1st January. Where will the Arsenal vs Fulham take place in the Premier League 2018-19 match? 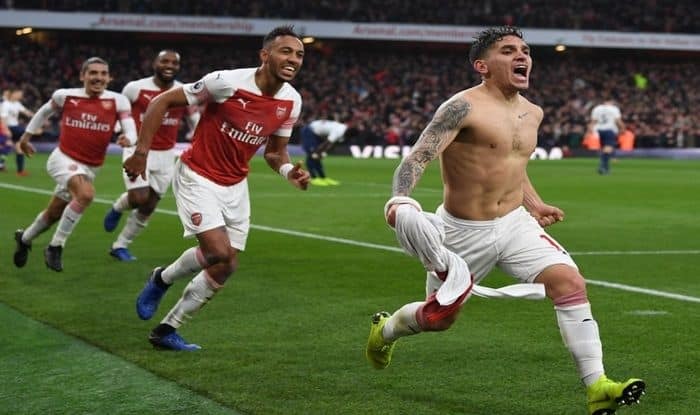 Which Indian Channel will telecast Arsenal vs Fulham in the Premier League 2018-19 match? STAR SPORTS network will telecast the Arsenal vs Fulham of the Premier League 2018-19 season. Where can I live stream the Arsenal vs Fulham match online? Leno; Mustafi, Koscielny, Sokratis; Maitland-Niles, Torreira, Xhaka, Kolasinac; Iwobi, Lacazette, Aubameyang. Rico; Odoi, Ream, Le Marchand; Christie, Anguissa, Seri, Sessegnon; Cairney; Vietto, Mitrovic.